The final metro area employment report for 2018 came out this morning. 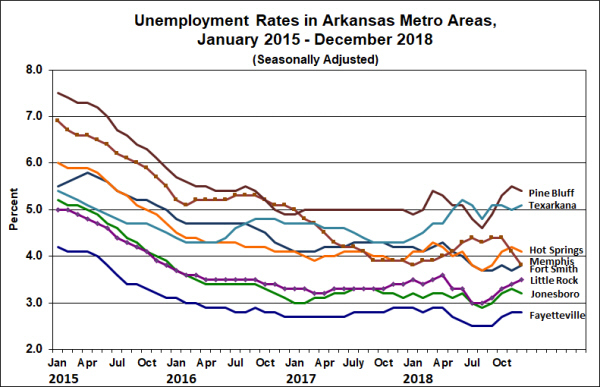 In December, unemployment rates among Arkansas metro areas showed a mix of changes. From November to December, seasonally adjusted data showed unemployment rate declines on four metro areas (Hot Springs, Jonesboro, Memphis and Pine Bluff). 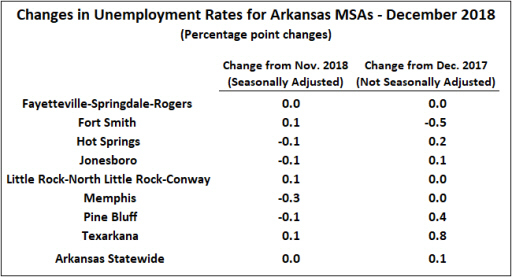 Fort Smith, Little Rock and Texarkana saw upticks in unemployment, while the rate was unchanged in Northwest Arkansas. Compared to a year earlier, not-seasonally adjusted data indicate that rates are unchanged to up slightly, with the exception being Fort Smith’s 0.5% decline. The figure below illustrates the recent paths of metro unemployment rates. Across the state, unemployment rates showed declines during the late spring and summer, reversing those changes during the latter months of the year. (Memphis is an exception, showing nearly the reverse pattern.) This short term fluctuations are typically smoothed out when the data go through the annual revision process. We’ll find out the results of those revisions on February 28. 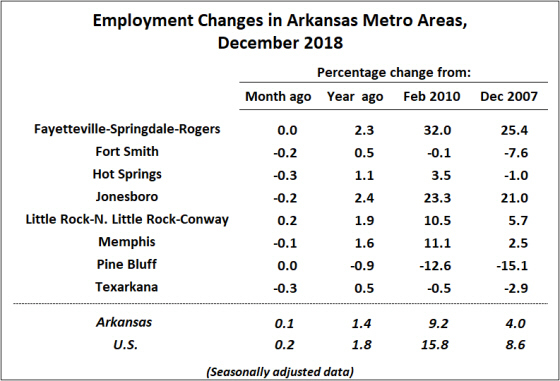 Nonfarm payrolls showed employment declines for most of Arkansas’ metro areas in December. Little Rock was the only metro to experience a month-to-month employment increase, with Fayetteville and Pine Bluff essentially unchanged. Compared to December 2017, employment was up in all metro areas except for Pine Bluff (-0.9%). The largest year-over-year increases were for Jonesboro (2.4%) and Fayetteville (2.3%). Employment growth in 2018 was generally consistent with the trends that have prevailed in recent years. Fayetteville and Jonesboro are clearly the fastest-growing metro areas in the state, with Little Rock and Memphis growing at a somewhat slower pace. Since February 2010, when employment reached a low point both statewide and nationally, total employment has changed very little in Fort Smith, Texarkana and Hot Springs. Pine Bluff has experienced a cumulative 12.6% decline over that time. 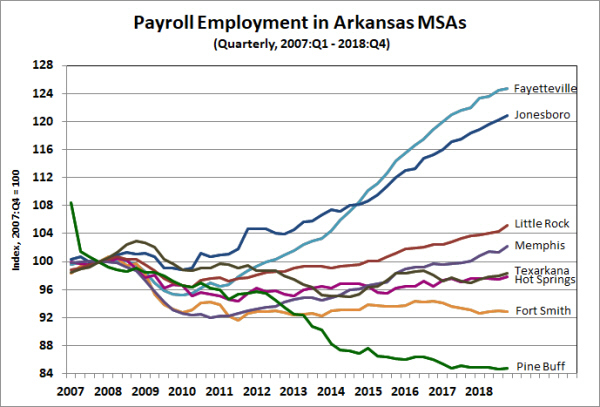 Compared to the pre-recession employment peak (December 2007), employment has still not fully recovered in Fort Smith, Hot Springs, Pine Bluff and Texarkana. The payroll data will also be revised before we get another current reading on the metro area employment situation. The annual “benchmark” revisions can sometimes be substantial, especially for metro areas. The revised data will not be available until mid-March. We will revisit the metro area employment statistics for 2018 after those revisions are released.